Heirloom tomatoes are one of my favorite summer treats. So delicious and the colors and shapes are unique and beautiful. I love the way they look when you slice them, and all the colors and textures. Their imperfections and details is what makes them so perfect and gorgeous. The taste is luscious and fresh - nothing like a regular tomato. The heirloom tomato season is not very long, but they're still around in New York, so I picked some up at the new Eataly Market, to prepare this dish. Eataly, by the way, is an incredible Italian foodie paradise of grandiose proportions. I've been quite a few times now, since it is so close to where I work in Manhattan. I decided to create some Indian spice infused heirloom tomatoes using my produce from the marketplace. It's quite easy. Mix the various spices and herbs below with the balsamic vinegar and olive oil and add the tomatoes and a sliced kirby cucumber. Allow to soak for a minute or two before serving with freshly made mozzarella. I love the way the Indian spices mix with the fresh goodness of the heirloom tomatoes. It's a wonderful way to say goodbye to summer. The kirby cucumber by the way, is from the locally grown produce section of Fresh Direct. 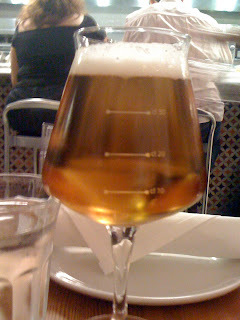 And before you thought I forgot - a bit of a review of Eataly Market. 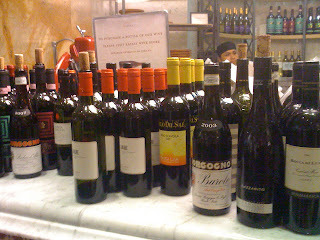 I love Eataly - everything there is fresh, gourmet and absolutely screams out Mario Batali. There's quite a few restaurants there, and even though I have been about 5 times already, I have not tried them all. So far, I have tried the panini bar, La Piazza, Verdure, La Pizza and La Pasta. Next I'd like to try the raw bar restaurant (Il Crudo), the fish restaurant (Il Pesce), and the gourmet beef restaurant (Il Manzo). In fairness, I should warn readers, the place is a hot spot right now. It will cool off, but right now the crowds are pretty fierce, even at lunchtime during the week. On my first visit, I went to the panini bar and had a brasaole, arugula and pesto panini which was delicious (not pictured). Then, I went back to the absolutely crazy Saturday night atmosphere with my husband. First, we stopped a the Piazza and enjoyed a sampling of parmesan cheeses with a glass of Italian spumoni. Next, we decided to try the pizza and pasta restaurants. I had one of the fabulous Italian sodas. I've tried a variety of the Italian sodas at Eataly - I've never seen any of them anywhere else in NYC, but the ones I've had so far have been fabulous - rhubarb, lemon, lime - a whole variety of flavors and not overpoweringly sweet like American sodas. My husband had a Moretti beer. At La Pasta/LaPizza we both started with a fabulous dish of the homemade fresh pasta in a pesto sauce - it was one of the best pesto dishes I've had. Fresh and simple, but oh so good. Then we followed with a basic pizza, which was good, but perhaps a bit too much cheese. But oh that crust - it was irresistible. The cheese was still great though, and of course they make their own mozzarella fresh at Eataly every day. 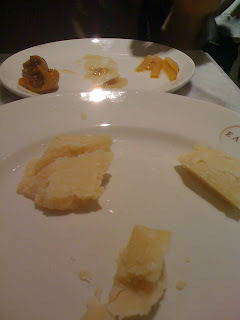 I have also had the opportunity to try the gelato at Eataly, which despite the long lines, does not dissapoint. I had two favors that would seen not to go well together - Fig and Hazelnut, but they were actually both delicious and went together just fine. I love fresh figs and the fig gelato took me back to that day in Napa a couple years ago where I tasted fresh mission figs from the trees. Finally, I have tried Verdure (food pictured above), the vegetable restaurant. There were so many great choices on the menu, including specials. However, I went with a lime flavored Italian soda and vegetables a la piatra, a dish that was composed of a variety of fresh market vegetables, from cauliflower to asparagus to sprouts to radicchio, to zucchini and just about everything else you could imagine. It was an amazing vegetable salad. The brushetta of the day was also amazing - fresh sweet corn with chives and black garlic. The black garlic was amazing, with an almost balsamic/tamarind like taste - so exotic and delicious. I plan to make my own bruschetta using some later this week, since they sell it at Eataly market. I also love heirloom tomatoes and this salad looks really refreshing!